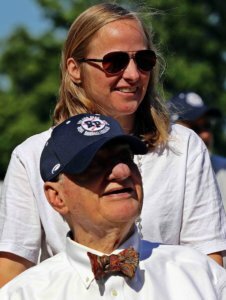 The latest installment of Names and Numbers includes a commencement speech from a Paralympic swimmer who attended Notre Dame Preparatory School, a fundraiser initiated by Loyola Blakefield grad, and recognition for two longtime volunteers in a youth baseball league. Amount raised at the Casey Cares second annual Rockfish Tournament June 2 in the Chesapeake Bay (see photo above). The event was created by John Sovero, a Catonsville native and graduate of St. Mark School and Loyola Blakefield in Towson. More than 30 boats searched for the biggest rockfish, beginning at dawn. 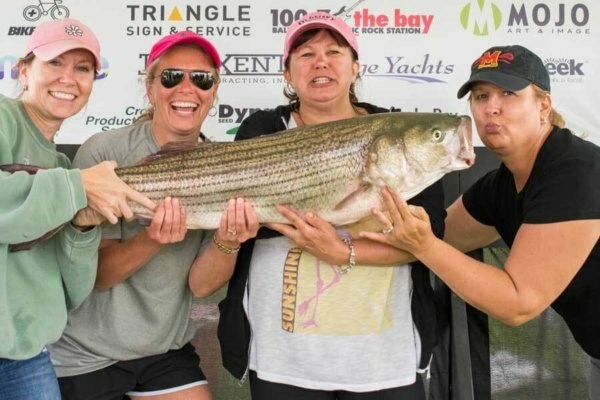 They returned to the Bay Bridge Marina on Kent Island for judging; Jason Zagasky and the “Rockin’ Robin” crew caught the largest fish at 14.5 pounds. Monies raised will support families with critically ill children. 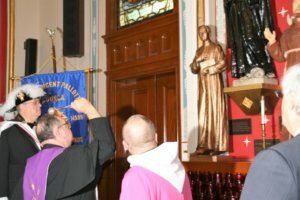 Donation made by the Knights of Columbus St. Vincent Pallotti Council 14535 for a statue of Father Michael J. McGivney, founder of the Knights, given to their parish, St. Leo the Great in Little Italy. Pallotine Father Bernard Carman, pastor of St. Leo, accepted the gift and blessed it at a Mass in early spring. According to the council, the statue is the only one of Father McGivney on permanent display in a church in Maryland. Father McGivney was ordained a priest at the Baltimore Basilica in 1877; less than five years later, he founded the Knights of Columbus. Father McGivney was venerated as a Servant of God in 2008. 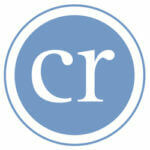 Year the Roland Park Baseball Leagues was founded. Its inaugural Hall of Fame class, inducted June 3, included Charles and Louise Macsherry, parishioners of the Cathedral of Mary Our Queen in Homeland. Charles is pictured at the ceremony with his daughter, Caroline Macsherry Mapp. Described as the “heart and soul” of the RPBL, the Macsherrys’ volunteer service to RBPL has encompassed a number of roles, from administration to opening their home for meetings, gatherings of coaches and storing equipment. Native plants put in a garden near the athletic fields by fourth-graders at Immaculate Conception School in Towson, part of a capstone project that also involved the fifth grade during an expansion of the school’s science programs. 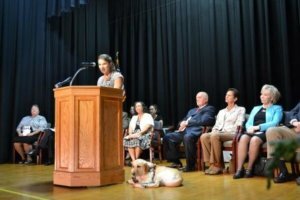 The school used a $5,000 grant from the Chesapeake Bay Trust toward field trips to Conowingo Dam, a sustainable dairy farm, and instruction from the staff of NorthBay. 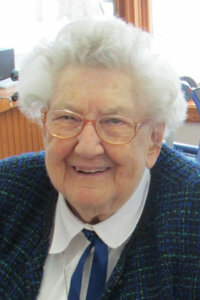 Years as an Our Lady of Victory Missionary Sister for Sister Marilyn Schatz. An Ellicott City native, she attended Trinity Preparatory in Ilchester, served in Texas and seven other states, and returned to the Archdiocese of Baltimore in 1980 to serve as director of religious education at the Shrine of the Little Flower in Baltimore. She served in the same position at St. Lawrence Parish in Jessup, 1982-83, and at St. Augustine Parish in Elkridge, 1983-93. Categories in an awards ceremony for nurses celebrated by Mercy Medical Center in Baltimore in observance of National Nurses Week May 6-12. Pictured, from left, are Kim Bushnell; Religious Sister of Mercy Helen Amos; Tiffany Zebeck, recipient of the Community Impact Award; Elizabeth Carnucci, recipient of the Compassionate Caregiver Award; Sister Elizabeth Ann Corcoran; Elizabeth Johnson, recipient of the Nursing Leadership Award; Sister Fran Demarco; Nancy McCready, recipient of the Nurse Visionary Award; and Susan Finlayson. 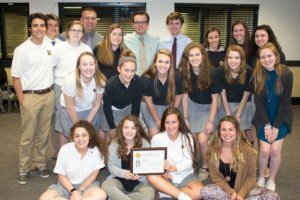 Awards won by “The Patriot,” the student newspaper of The John Carroll School in Bel Air, including the Online Pacemaker Award from the National Scholastic Newspaper Association. “It’s the newspaper equivalent of winning the national championships,” said Mark Ionescu, faculty advisor. Outgoing editor in chief Caroline Cooney, who graduated May 27, said the staff, pictured, had made a conscious effort to redesign the paper’s online presence. “The Patriot” also won a Silver Crown Award from the Columbia Scholastic Press Association for the third consecutive year.